A new entrant into the legal international anime streaming scene has arrived—Daisuki. What makes Daisuki unique is that it enjoys the direct backing and co-production of several major Japanese animation studios, namely Aniplex, Sunrise, Toei Animation, TMS, and NAS. (In this it is similar to an analogous service launched by several major Japanese manga publishers, the now defunct J-Manga.) Launch titles include Madoka Magica, Lupin III, Gundam Seed, Prince of Tennis, and One Piece, and they have also posted a survey to help decide which titles to add next. Besides streaming anime for free, they also have plans to develop merchandise available for purchase, with a launch giveaway campaign to start. We got a chance to ask Eri Maruyama, Daisuki’s International Business Development representative, some questions about the service, its goals, and how it sees itself in a field that already has legal services like Crunchyroll and Funimation. AD: Describe the genesis of the Daisuki idea—how did the decision to form this group to distribute anime digitally in America directly come about? Maruyama: It was a kind of natural development since each of the companies started to think the same thing: one legal platform from Japan directed at overseas fans to provide their content. By the way, DAISUKI will be available world wide. AD: Is there a monthly fee or is it pay per download? What are the proposed rates? Maruyama: DAISUKI.net is a streaming service. Basically you can watch all Animes for free, some premium content will be fee-based. 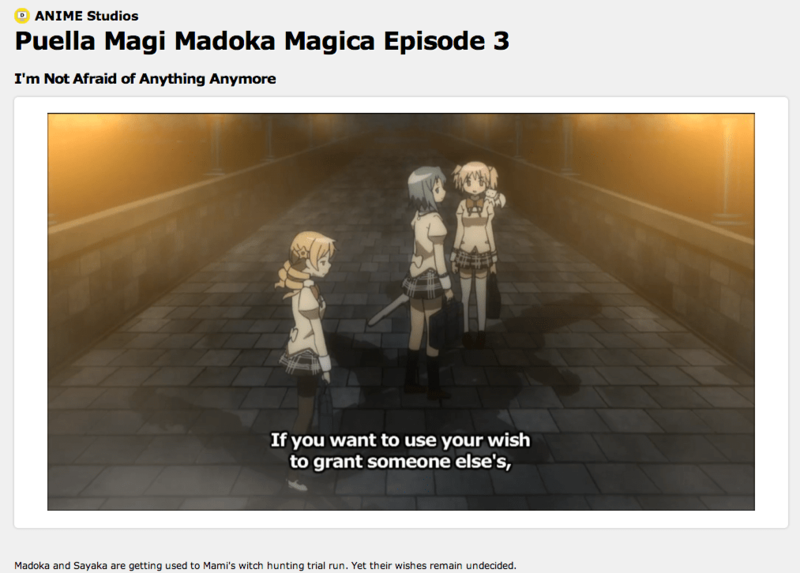 AD: Some of the titles proposed, such as Madoka Magica and One Piece, are already available through legal streaming from Crunchyroll. Does this mean that CR or other legal streaming services that current carry Daisuke-hosted titles will lose their streaming license? Does Daisuke see itself as competing with those services? Maruyama: No, they may continue their service. The streaming rights at DAISUKI are non-exclusive rights since our main purpose is not to get exclusive users for DAISUKI but to provide legal material. So, as long as fans are watching anime on other legal sites, that’s absolutely ok. We don’t see us in a direct competition with other sites. Rather would we wish to fight effectively together against piracy. Maruyama: We are planning to simulcast series. Moreover we are able (thanks to the direct connection to the studios and companies) to provide exclusive footage like making-of material or video messages of creators, voice actors and so on. AD: With the goods/merchandising arm of Daisuki, is the plan primarily just to import related merchandise from Japan, or to also perhaps create overseas-unique items for sale as well? Maruyama: we are still in the planning phase, but there will be definitely some exclusive items only available at the DAISUKI web-store. AD: Recently an analogous digital distribution channel begun by several large Japanese manga publishers, J-Manga, folded. How does Daisuki intend to ensure the growth and success of the venture in an industry that is going through many transitions and challenges today? Maruyama: It was a pity that J-Manga had to close down. The battle against piracy is indeed hard. At DAISUKI you can watch most of the content for free. We believe that overseas fans would pick the legal option if the conditions are the same. Hopefully, they will like DAISUKI and our service.